A week in Japan already. It’s absolutely flown by. I love it here a lot. It makes me a giddy goat. This is a trip to see places using music as the catalyst, but it’s much more than that too. I was reluctant to label it ‘travelling’ because that makes me think of knobs with backpacks, but I have a backpack and I am a knob, so I’m ‘travelling’. I’m seeing my favourite music in its native environment, finding out how other people live, and also a great deal about religion because it so closely ties in with the music that I love. I think access to music for people was often through the church (it still is in Africa), so music was religious. I’ve been thinking a lot about the general way of being here and I’ll try and word it. Old English pagan beliefs, which are a very spiritual appreciation of nature really, the sun and moon, a love for each other, etc, are the closest thing I have to attaching myself to ‘something’. It isn’t monotheism. It’s the one thing that has made any sense to me. It’s not a religion really, it’s just life. I neither want nor need a God or a higher power or any of that stuff to worship and rely on. I’m really fascinated by it because I’m trying to understand why people need that in their life. Sure, there might be a ‘Universe’ looking after stuff, that makes some sense to me. But everything is cyclical too; good happens, bad happens, we like some people, we don’t like some people, we have good days, we have bad days – it’s just what life is. Things change and things stay the same. We vibrate as beings and are in tune with some people and not with others. A good attitude and generosity towards others usually results in the same happening towards you. We have good luck and we have bad luck. Being positive around people makes them feel good and hopefully makes them feel positive too, same with being a negative nelly all the time. It’s all rather simple stuff. In Britain and Europe, the Christians came and replaced pagan practices, ceremonies and ideals with their own. Christmas is around the winter solstice, when the sun is at it’s lowest point in the sky, the 21st of December, before rising again. The sun rises. The son rises. The Egyptian God of the sun was Horus. God of the sun – Son of God. The Bible makes no mention of a date for Jesus’s birthday. It’s a time for celebration because the cold and dark is generally a bit naff, so lights were used and the sun starting its cycle back to summer is to be celebrated. Midwinter festivals were widely celebrated all over and could be readily converted by Christianity making its way round. Many people saw Jesus as a spirit, so Roman Christians used that time to mark Jesus’ ‘birthday’, ensuring he was considered human and not spirit. A Christmas tree is from decorating the house with greenery in winter. Giving presents more or less comes from paganism too, but not loads of them, and I think it was done at New Year. The idea was to give a loved one something special that means something to you, be it something you’ve made for them or a treasured item. Easter – it’s of no fixed date and is decided according to the patterns of the moon. Ishtar, Mithra, Dionysus – all resurrected Gods over the years. Eostre was a pagan festival with a great northern Goddess symbolised with a rabbit. Hallowe’en – now a time to dress up as dead people, but it’s Celtic pagan and called Samhain, pronounced ‘sa-win’, and sits between the two solstices. It’s a time of bringing in the darkness before the winter solstice. The list goes on. Many of the celebrations started in a time when life was very different – we don’t consciously celebrate crops or light or harvests now. It was never about living in sin and praising a birthday, thanking a man for coming to save us from our sins, and living your life under the promise of heaven. I don’t live in sin, thank you, I live in Walthamstow. 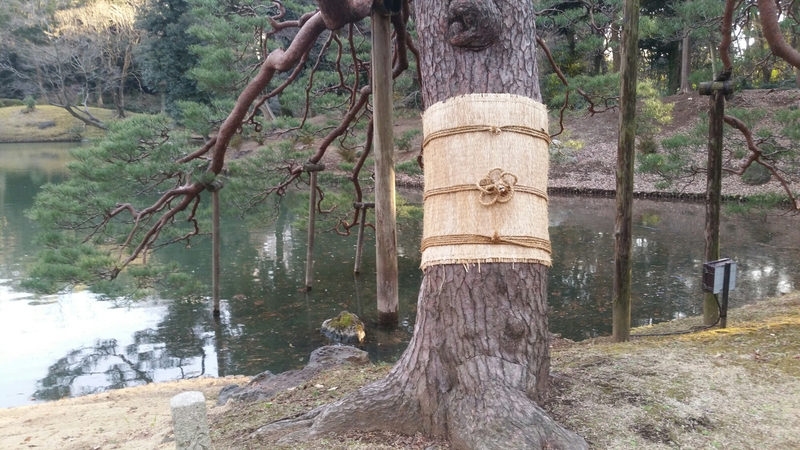 The spirituality to those old pagan traditions is similar to how it still is in Japan. It’s spiritual, not religious. They don’t really have a religion as such. There are Buddhist Temples and Shinto Shrines, and people pray, but not to 1 God. Japan is the land of 8 million Gods. They don’t think they live in sin. There are Japanese Catholics but that’s very recent and is a minority. They don’t kill people for having a variation in belief of the same thing as them. They don’t use the promise of heaven to control people. They are deeply spiritual and not monotheistic. They love and appreciate life, nature and other people. And that is so completely and utterly refreshing to me. Buddhism and Shintoism are different from each other. Buddhism is for funerals and Shintoism for weddings, for a start. Buddhism has a Temple and Shintoism has a Shrine and it’s difficult for me to tell the difference until I get more used to them. Buddha taught that the universe is constantly changing, including us and our psychology, so we can’t have ‘the self’. When I read that my eyes opened very wide indeed. That’s me all over. I feel a million different people from one day to the next, as Bittersweet Symphony said. I look back on a photo of me from 2 or 3 years ago and I don’t see myself there at all. It’s someone else. Here they do celebrate some of these ‘Christian’ festivals but without the religious bit. They celebrate Christmas, with Santa Claus and Christmas trees and stuff, but it’s a festival that celebrates love. It’s for couples to show appreciation to each other, or for single people to show love to their family. It’s a bit like what the idea was behind Valentine’s Day before it became pressurised commercial omni-tosh. Valentine’s Day in Japan is about sweets. Men give women candy and women give men chocolate. Cracking mate! Easter is brand new and is just about chocolate bunnies – bunnies of course being Eostre. Hallowe’en is the American version of tricks, treats and costumes, and older Japanese folk wonder what all the fuss is about. The similarities between Tokyo and London are seemingly never ending. At the simplest level, the climates are similar and both places are an island, and I think that has a huge impact on people’s lives. The train network in Tokyo is just like the tube and Overground. People eat a lot and drink even more. 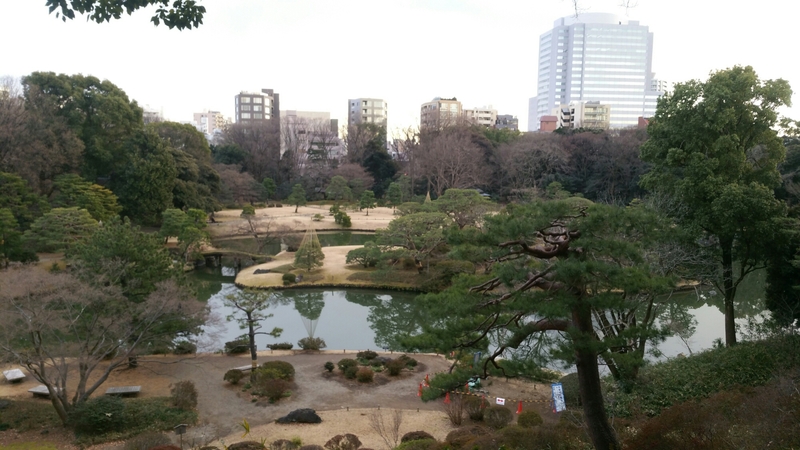 Gorgeous Japanese gardens are green and serene and have ponds, paths and cafes, and are surrounded by tall buildings, much like most London parks. People live on top of each other, but it’s no bother. Tea is very popular and we both drive on the same side of the road. Shops and restaurants and bars are everywhere. Signs are in Japanese and English. Baths and cats are everywhere and my childhood was basically baths and cats. You can buy and do anything. We share many chain shops. 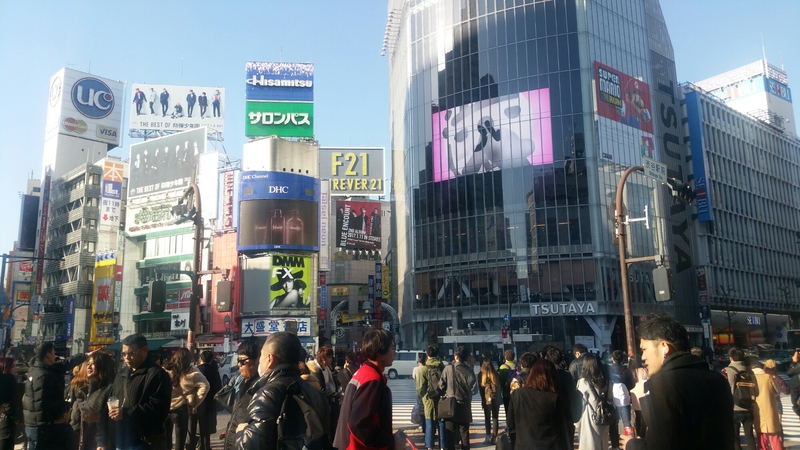 Tokyo is London, but friendlier, cleaner, newer, quieter and bigger. And things work. I adore London and always have. I’ve been there for 10 years this September. My Mum’s side of the family were all Londoners. They moved down from Hayes to Hayling Island in 1963, but before that the family were all from South West London – Putney, Chiswick, Fulham way. I identify myself as much more London than where I grew up, Portsmouth, although supporting the football team there means I’m forever linked with the city I grew up in. But I was the only one to ever go back up the A3. As a kid, Mum and I went on loads of day trips and weekends to London and I moved there at the first opportunity I had. With Tokyo being so similar to London, I just felt instantly at home here, literally within seconds. It’s a home from home. The general way of life here, I have seen so far, is to be kind, respectful, courteous, generous, loving, spiritual and calm. The country really does have this great spiritual depth that I can feel every day – but nobody is telling me what to believe or how I should behave, or thrusting religious panflets at me in train stations, or knocking on my door, or tutting when I talk about God like it doesn’t exist. This place vibrates at my frequency and these, amongst others, are some of myriad reasons why I have concluded that in the next few months, I’ll be moving to Tokyo. I’m being deadly serious! This must be the place. I haven’t written any ideas down since The Gambia, but that’s alright. I’ve put on a bit of winter weight. Animals migrate and hibernate in winter and it’s January and bloody cold here, so my brain is having a little rest from thinking creatively and just wants to eat. And boy can you eat in Tokyo. It allows me time to just live and experience things without constantly writing ideas down all the time, which is nice. The girls and guys of Girassol have been so utterly welcoming that I’m astounded by their generosity. This is the kindest place on earth and I so hope I am reciprocating it. I’ve done lots of fun stuff and hopefully I can remember it all. After that first great Girassol rehearsal last week, Ana put me in touch with a group that plays Samba and Pagode in a Brasilian restaurant called Que Bom in Asakusa. I popped down Tuesday night and played with them for the evening. I’ve barely played any Samba or Pagode at all so it was good fun. There were a couple of players who are half Japanese half Brasilian, which is fairly common I think. One of them, Claudio, with his glasses and ponytail, spoke Portuguese like a Brasileiro, and the ten of us swapped instruments around and played loads of tunes. The banjo player is a friendly chap and calls himself Gato Preto (black cat). He wears the hat and dungarees in classic Brasilian style, but he is completely old school Japanese, tapping his watch and skatting about restlessly. After we played, Gato Preto polished his banjo and caught a train, and the rest of us got the cachaca out. I lost 9 hours. I made it down to Terruzo Isle to see Bowie. I was upset at the end of the exhibition cos I could have been there forever. That man was unbelieveable wasn’t he. 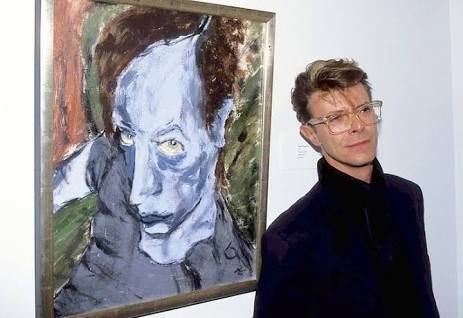 I never knew he painted – there was one portrait of a blue Iggy Pop that was amazing. The way he painted those eyes! They could be real. Loads of his costumes from over the years were there too, including the blue suit from the Life on Mars video and the outfits that Ziggy wore. His coat from Glastonbury 2000 was there too and it’s gorgeous when right there in front of you. Some of the exhibition was about his links with Japan too. He came here many times, choosing the traditional city of Kyoto as a place to visit regularly. 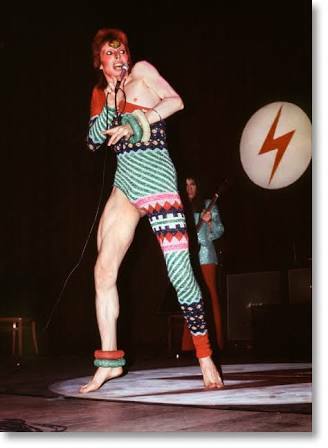 The famous black outfit with the huge legs and the coloured striped one leg outfit from the early 70s was done by a Japanese designer, Kansai Yamamoto. Bowie acted alongside Japanese musician Ryuichi Sakamoto (https://youtu.be/KDBLtOMYS00) in the 80s in a film called Merry Christmas, Mr Lawrence. ‘Some cat from Japan’ is a lyric in Ziggy. Bowie and Japan had great links and it was very cool to see that whilst actually being in Japan. Bowie is the king of feelings of alienation. For those of us that have never fitted in anywhere, he’s the one that shows us it’s OK to be different. I feel like I have never fitted in anywhere and felt alien my whole life, so that’s another reason for living here because then I’ve got ‘foreign’ to hide behind and I’ve always felt foreign anyway. 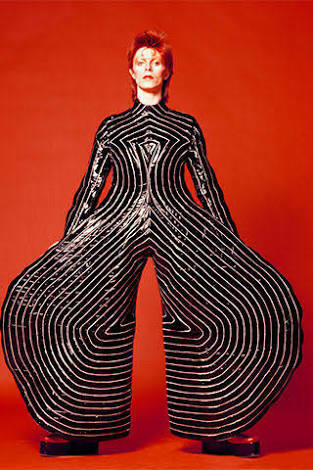 Bowie really liked Kabuki theatre too, and David Byrne wrote about it in How Music Works. I’d made a note in Lagos to go and see some, and Yukino in the band had offered to show me around Tokyo on Saturday, so I asked if we could see some Kabuki. 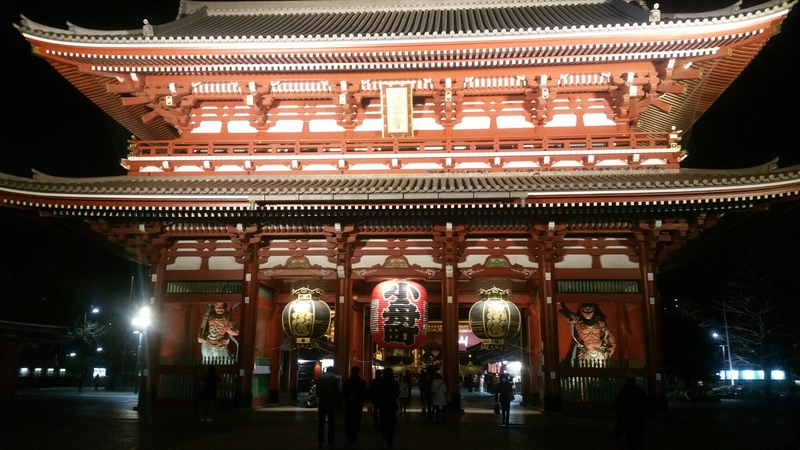 We went to a lovely theatre in Asakusa, which seems to be an area with everything in it. It was 3 hours and 3 plays and I understood absolutely nothing. But as an audience member, reducing a theatrical performance down to visuals, movement and music, the only things I could understand, was really great. The 2nd play was my favourite, that was really amazing. It had a lot less dialogue than the other two and was about a samurai. The elegant and graceful movements, and the humour, I really loved. As people fought him, he chopped off parts of their body, and seeing a chopped leg on a stick whilst the actor hopped off stage was really funny. The injuries were sometimes illustrated with a piece of red material over the chop, that flapped down on a sword swipe, as if the limb had gone. One bloke had his bum sliced off and the red material acted as chopped cheeks. Hilarious. Yukino said she only understood 60% of the dialogue so perhaps it’s a bit like Shakespeare in that respect. I know it’s an old form of Japanese theatre anyway. The make up and costumes and sets and everything else was fantastic. David Byrne wrote that he liked that stage hands become part of the performance in Kabuki, and they do. Not in that they have lines and movements, but that you just see them there on stage. In all 3 plays, they shuffled across the stage giving and taking props from the actors and kind of being like plot butlers. The use of music was great too and was used for probably 90% of the performances. Traditional Japanese instruments aided the story along and you didn’t notice it there sometimes. The musicians are on stage but in a sort of room at the side and watching through a bamboo window. It was so cool. I had a lovely little morning on Friday with an American girl called Kinsey who talked to me over breakfast in a cafe opposite the hostel. She was flying to Osaka that evening and will eventually look to settle in Bangkok. 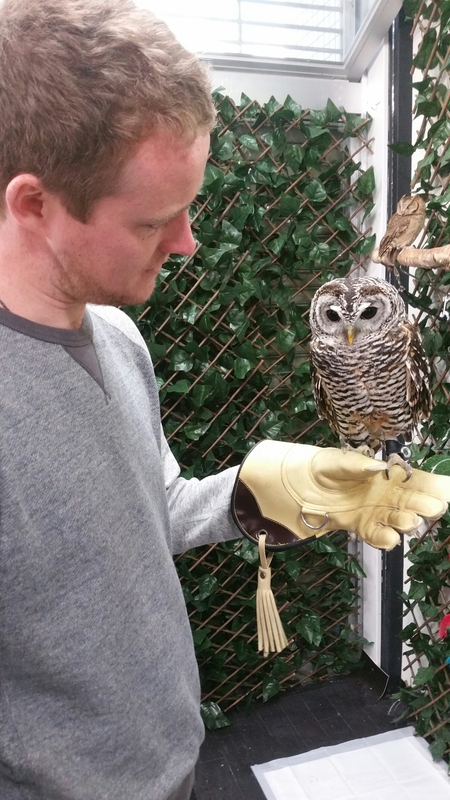 We went to an owl cafe in Asakusa. Whilst not holding the same appeal as cats, I do like an owl and even adopted one at a sanctuary when I was about 9 or something. Owls always look absolutely furious. I don’t know whether they actually are fuming, or that’s just the way their eyes sit, but they look bloody livid about something. 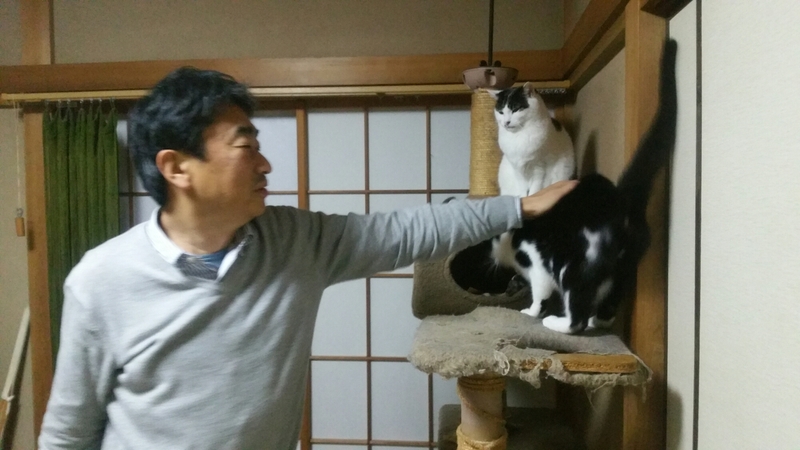 After staying at the hostel until Friday morning, I was kindly put up by Mayumi and Romin in Fuchu, the Tokyo ‘burbs. Those two are fantastic. Mayumi is a graphic designer and Romin is absolutely hilarious, and they live in the Tokyo suburbs, so in that respect they are a lot like my friends Caroline and Jude. They also have two cats so I’ve been loving that. I keep finding Tokyo-London equivalents in everything here, from food to customs to buildings to weather to people. Whether it is true or it’s confirmation bias I am not sure. Mayumi and Romin have a kotatsu, which doesn’t have a British equivalent. It’s a heated table you sit at under a blanket together and keep warm. Maki, Musical Director of Girassol, says it ruins people because you never want to get up again. She’s spot on. It’s well comfy. Perhaps the highlight so far, although all of it is just one very high light, has been the onzen, the Japanese hot springs. I had a futsukayoi, a hangover, so sweating it all out helped immensely. The spring was probably 20% proof when I got out. Baths are a big thing here anyway. There were these hot slabs to lie down on as well. Being an Englishman completely starkers around a load of Japanese blokes also completely starkers is a great way to spend a Saturday morning. There are different baths of different water types and you feel amazing afterwards. Ana and I have had a couple of great days. 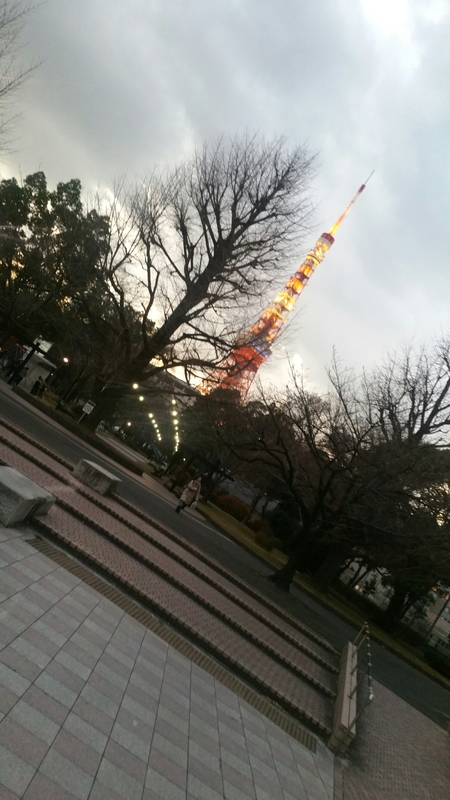 We’ve been to Shibuya, Harajuku and Omote-sando on one day and a Japanese garden called Rikugien in Komagome and Tokyo Tower another day. Her Mum’s parents are Japanese, she is Brasilian and a lot of her family are Spanish. She’s so cool and such great company. Some of her work is with Youtubers, some of it is with Brasilian musicians or English speakers who need a translator and city guide, so no wonder she’s brilliant to see the city with. She has been here 18 years and the only real traces of a Brasilian accent are when she says ‘Omote-sando’, which has been exaggerrated and become a running gag. We went record shopping and went to visit a Shrine in Harajuku but it had just shut. It was very close to Takeshita Street, known as the ‘cutest street on earth’. Kawaii, or cute, is a big thing here. Girls like to dress cute, things are made to look as cute as possible, items are made and bought for their cuteness. 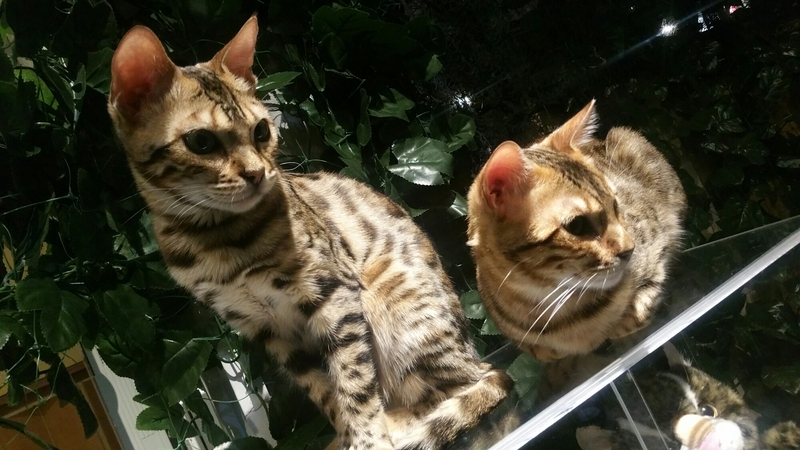 Usually the street is heaving but we strolled down and went to a Bengal cat cafe. These Bengals didn’t really like being touched but they are beautiful creatures. 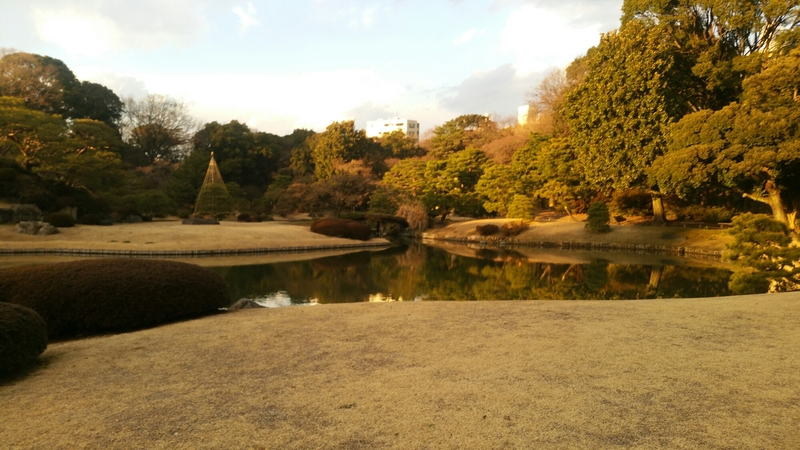 Rikugien gardens are gorgeous, even in mid-winter. 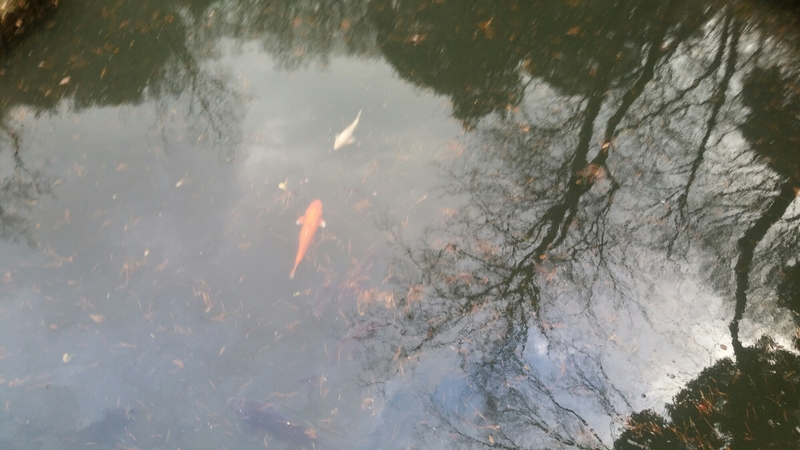 Beautiful Koi congregated in one part of the ponds and some of the gardens are islands in the pond. There’s a mini summit to climb up and look over the park and trees, grass, flowers, ducks and water make for a very British and very Japanese park. The ducks were all the same as Britain – mallards and tufted ducks – but there were no coots and moorhens. And no screaming kids either. Wrapped around the trees were bamboo belts designed to prevent insects, who travel down the tree from top to bottom on the trunk and eat it, getting to the roots. It’s put on in autumn and removed in spring and burnt with all the insects living in it. Another super rehearsal was had on Sunday with Girassol. They’re really very good. Bianca, another singer, came by and she’s got a beautiful tone and voice. She sounds really Brasilian. Their set for the big gig in February is coming on really nicely and includes all sorts of Ijexa, 6/8, Ile and Olodum breaks and massive tunes from Bahia. They play with real heart and soul and can groove like the best of them. The way they play, the music sounds like it is smiling. We had some grub after rehearsal again and much jollyment was had. I stayed with Tokochan and Katsuhida, who are so lovely, and have a flat looking at Mount Fuji. The 3 of us carried on after dinner. We went to a bar in Nakano, which is an area famous for Manga, and I ended up DJing in there. I played some 80s RnB and then some Toe, who are this amazing Japanese band that Dom showed me. Apart from Sena in Girassol (who was the studio engineer on their last album), they’re not that known here, but they are such a good band. There was a fella who was half French half Japanese in there with his Chinese girlfriend. I spoke to them for ages but I remember sod all. I think I was even speaking French so anybody that knows my French can imagine what I was saying. ‘Je sera habite ici’ probably. Actually I half remember telling them about Turning Japanese by The Vapors and how the beginning is Chinese music. Instead of writing ideas down, I’m writing Japanese words down. One very handy one is ‘sumasen’, which means excuse me, or sorry. I recognised it when I saw it written down and it’s formal form is the title of a John Lennon song from Mind Games called Aisumasen (I’m Sorry). It was odd cos in the hostel I watched a documentary on Youtube called ‘The Day John Lennon Died’ on Thursday and I’ve been listening to him a bit whilst here. I asked the others about Yoko. They agreed that she’s really talented but isn’t really someone people think about here. I wonder if the negativity towards her in Britain was more a racist thing than anything. She didn’t split the Beatles, Paul McCartney’s ego did. This tune is really gorgeous and could only have been written by John. The solo at the end is a corker as well. Now I’ve just arrived in Nagoya, Japan’s 3rd biggest city, to spend a few days with Aya’s parents, which is very exciting. Kyoto is only 2 hours drive away and that’s on the agenda too. 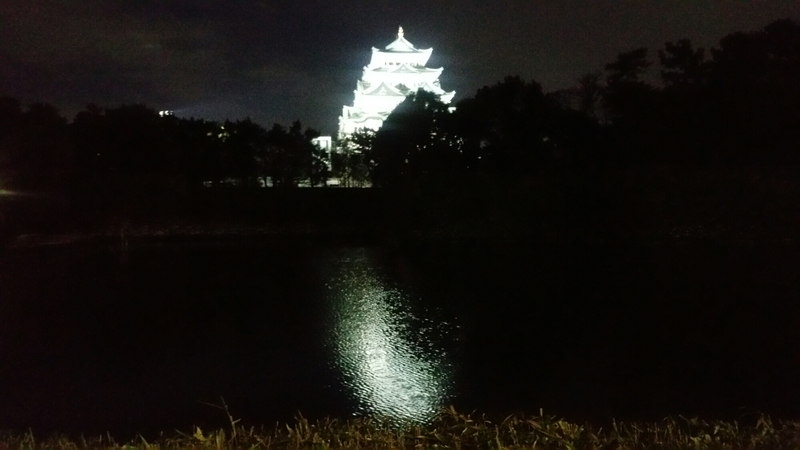 Nagoya’s use of light at night is gorgeous and the Shrine looked great this evening. Cracking stuff.